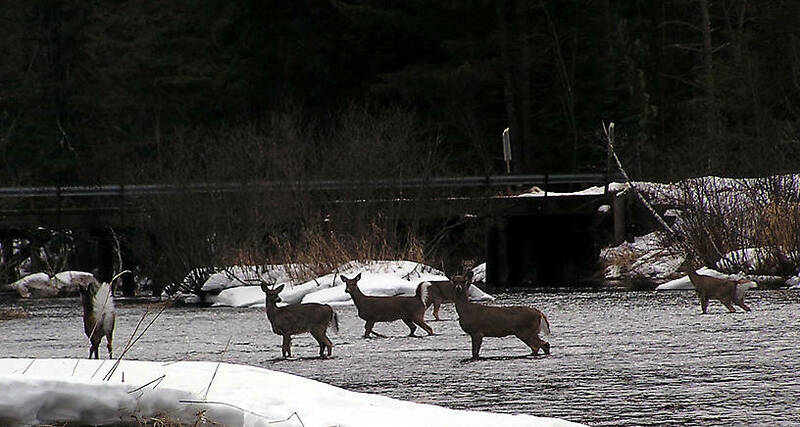 Several whitetail deer cross the river in front of me in the middle of winter. 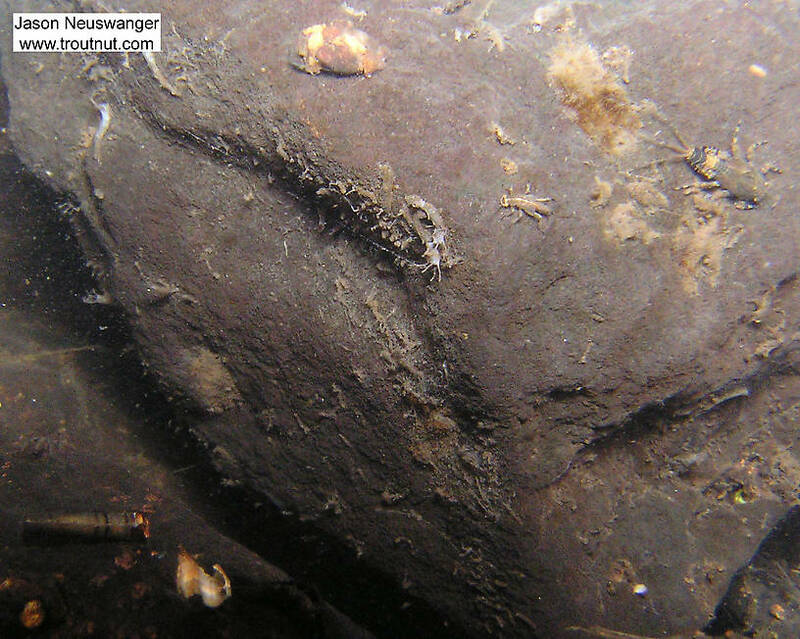 There's a large Ephemerella subvaria nymph in the top left. In this picture: Mayfly Species Ephemerella invaria (Sulphur Dun), Insect Order Trichoptera (Caddisflies), and Mayfly Species Ephemerella subvaria (Hendrickson). 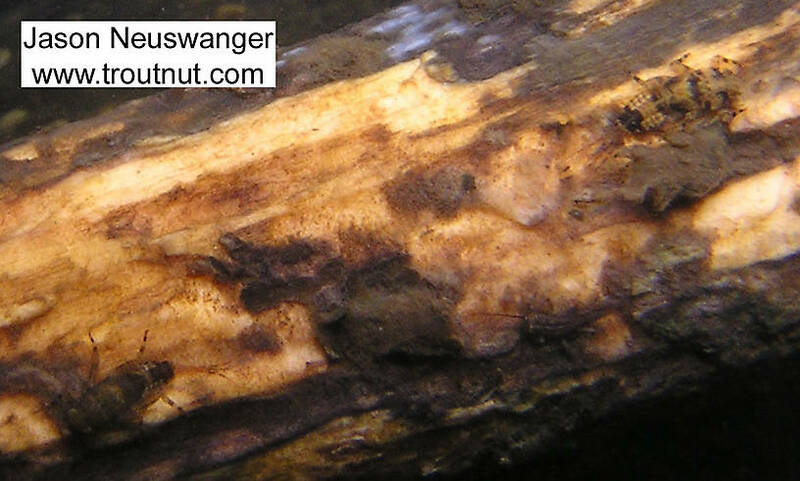 There's a stonefly nymph in the bottom right corner of this picture, but what's really interesting is those white blotches. 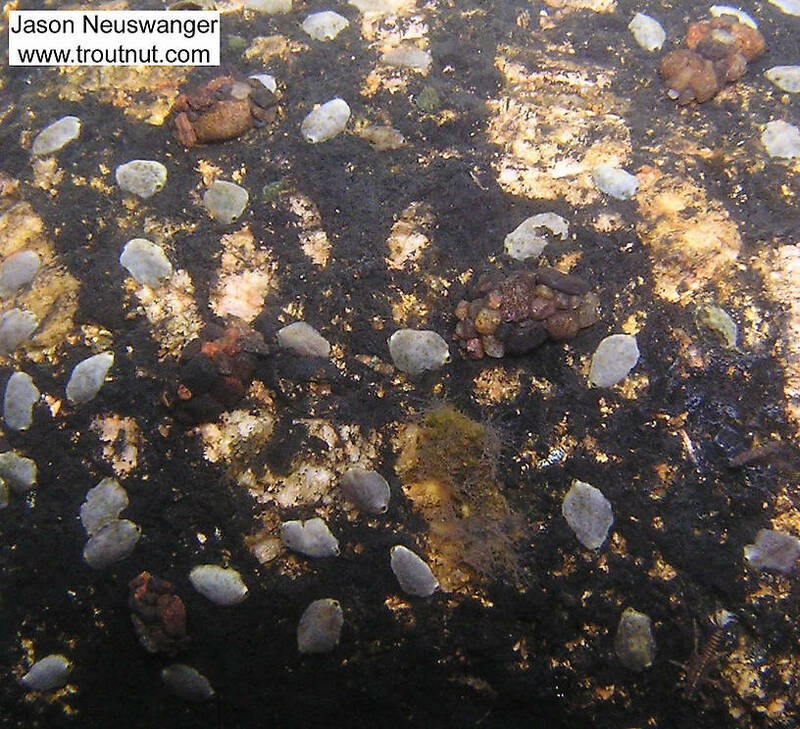 They're pretty common in my Wisconsin home river river, stuck flat onto the rocks--lots of rocks have a speckled look as a result. 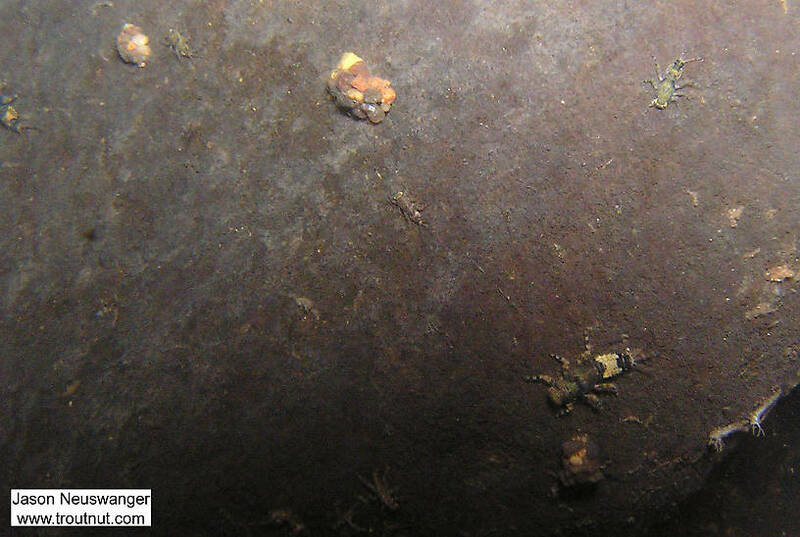 They are microcaddis cases, made by larvae of the caddisfly family Hydroptilidae. These are made by larvae of the subfamily Leucotrichiinae, most likely the genus Leucotrichia. They spin little flat oval cases of silk tight and immobile against the rocks. 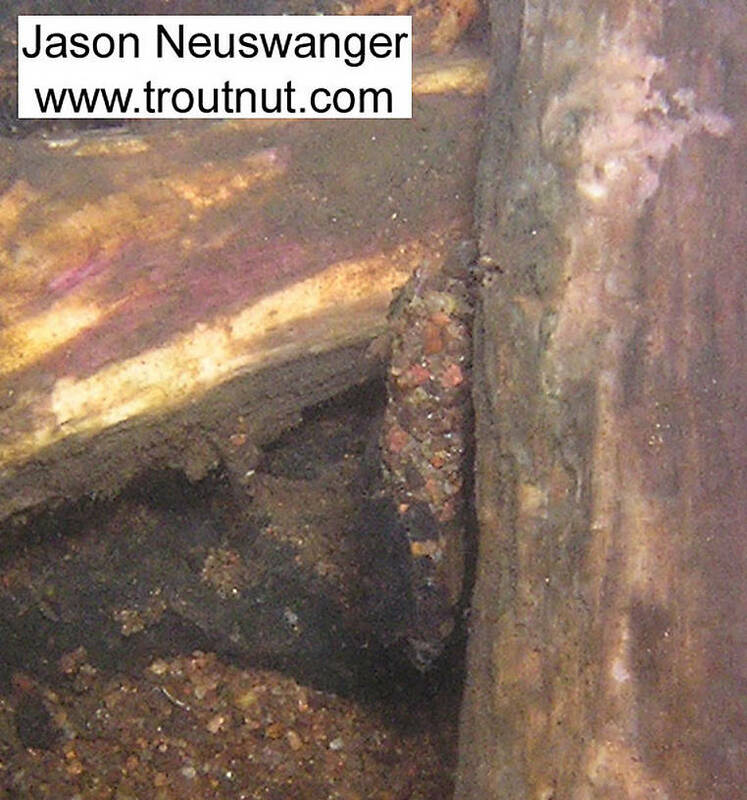 In this picture: Caddisfly Species Leucotrichia pictipes (Ring Horn Microcaddis). The mayfly and stonefly nymphs in this picture blend in extremely well. In this picture: Mayfly Species Ephemerella invaria (Sulphur Dun) and Insect Order Plecoptera (Stoneflies). 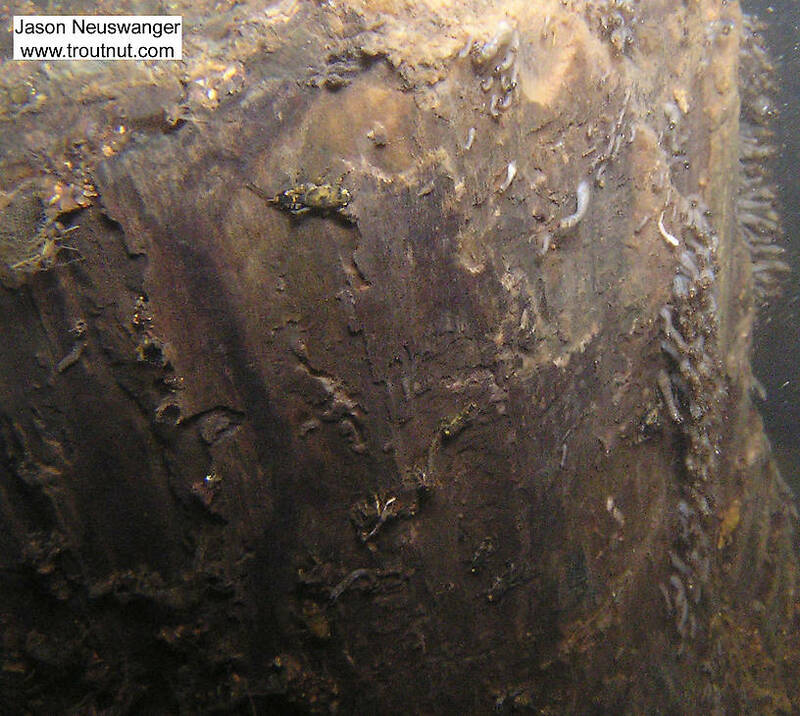 The top of this stump is covered with mayfly and caddisfly life. 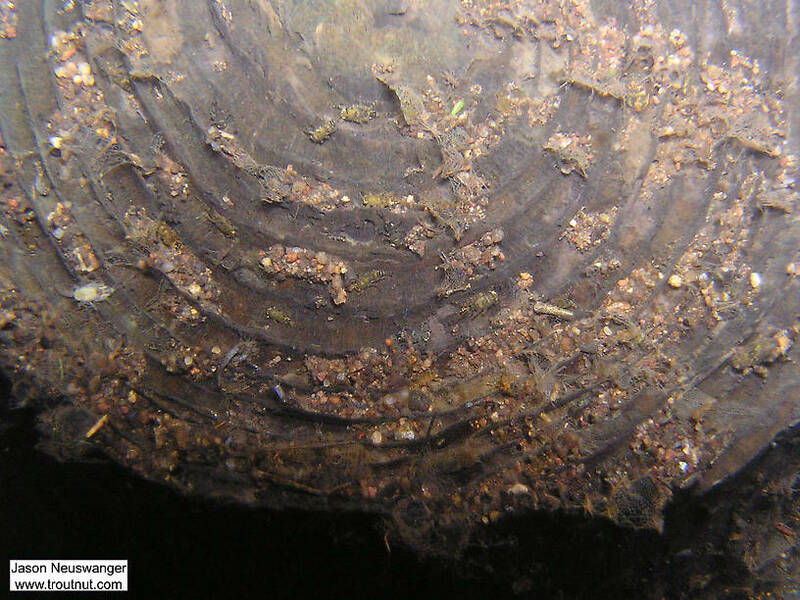 In this picture: Insect Order Trichoptera (Caddisflies) and Insect Order Ephemeroptera (Mayflies). 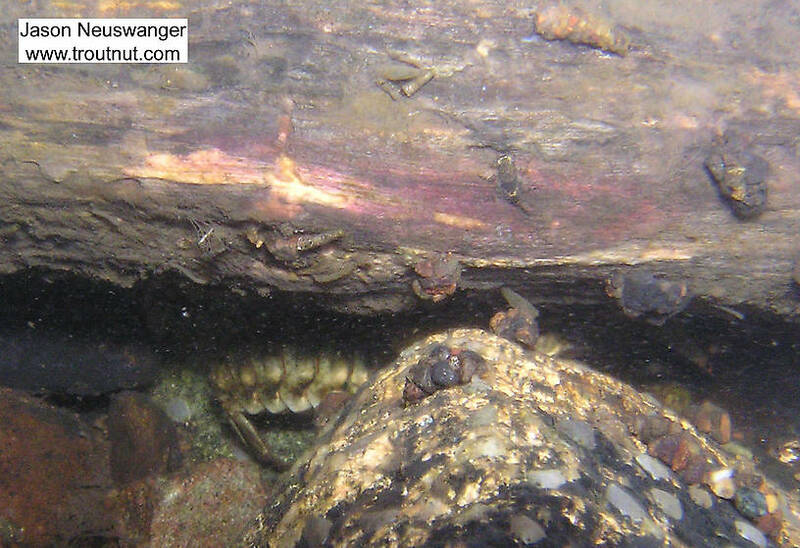 A large crayfish lurks under a log which is home to several mayfly nymphs and caddisfly larvae. 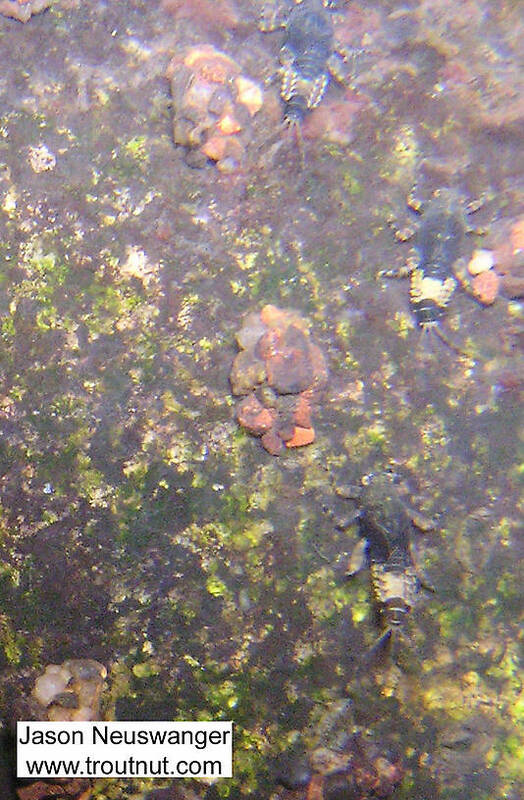 In this picture: Arthropod Order Decapoda (Crayfish), Insect Order Ephemeroptera (Mayflies), and Insect Order Trichoptera (Caddisflies). 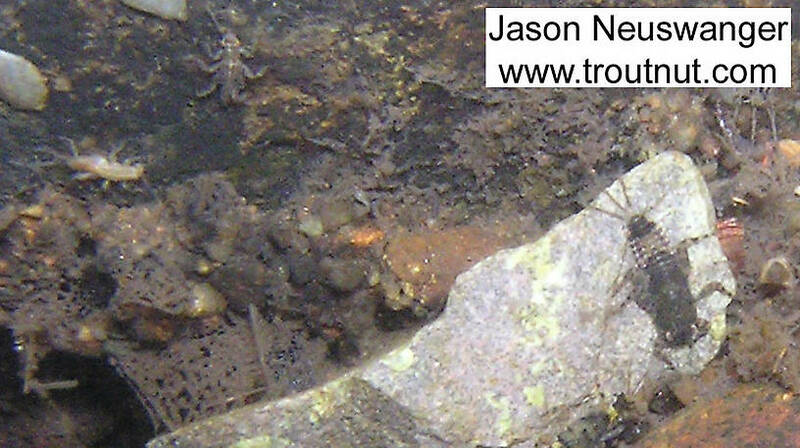 This picture shows some of the intricate homes woven by net-spinning caddis larvae. 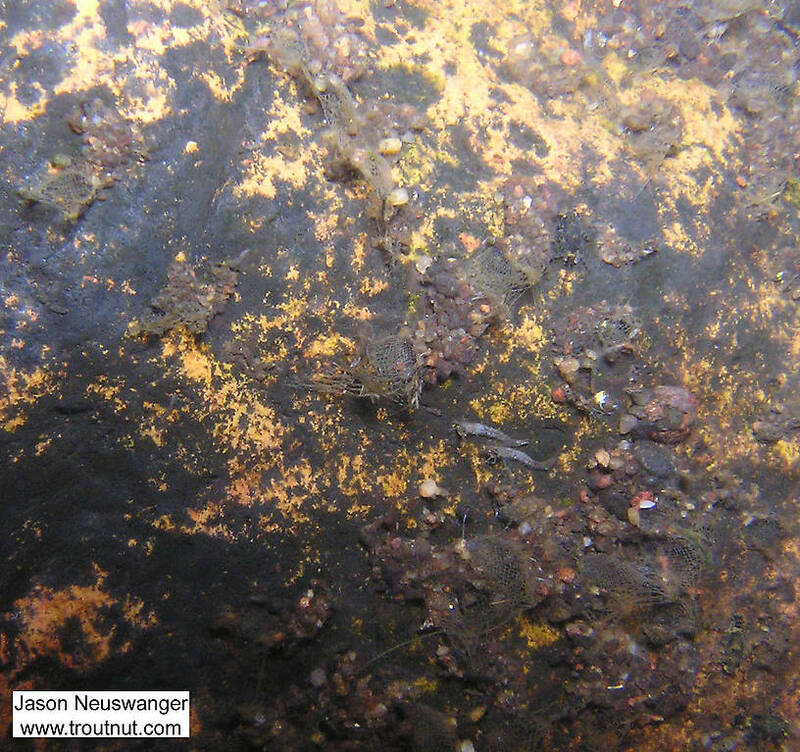 In this picture: Mayfly Species Ephemerella subvaria (Hendrickson) and Insect Order Trichoptera (Caddisflies). 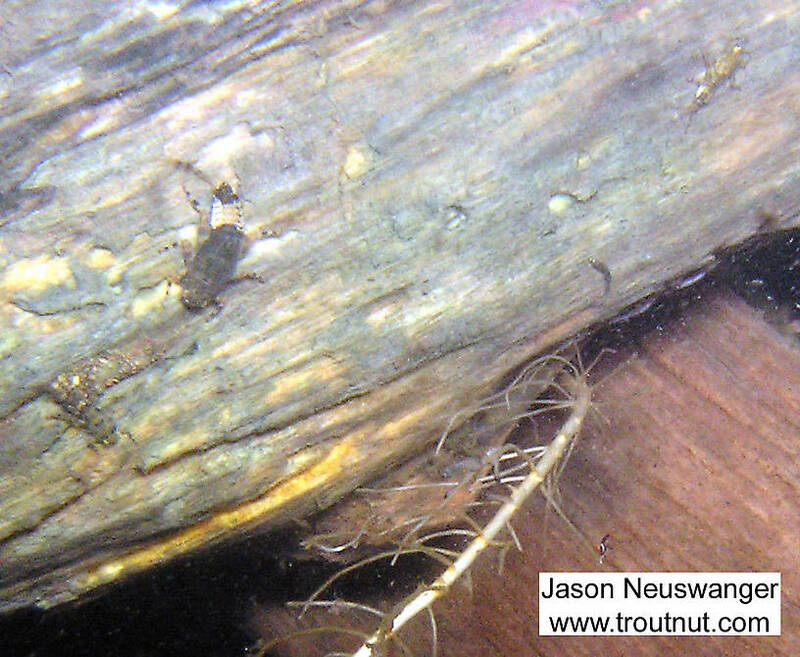 A large Ephemerella subvaria nymphs clings to a log along with a couple smaller mayfly nymphs. 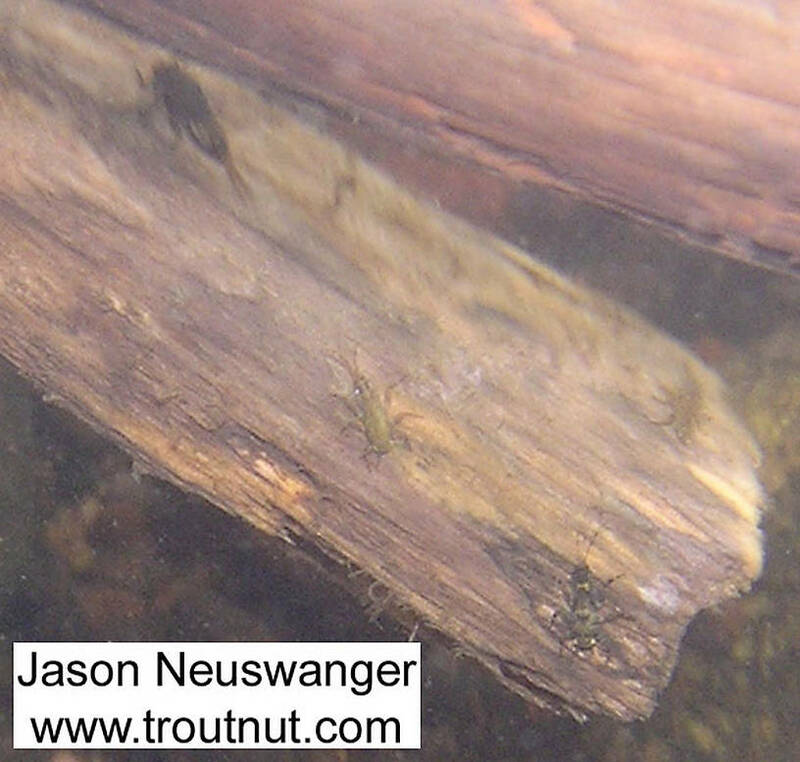 A couple Sulphur (Ephemerella invaria) nymphs cling to a log. In this picture: Mayfly Species Ephemerella invaria (Sulphur Dun). 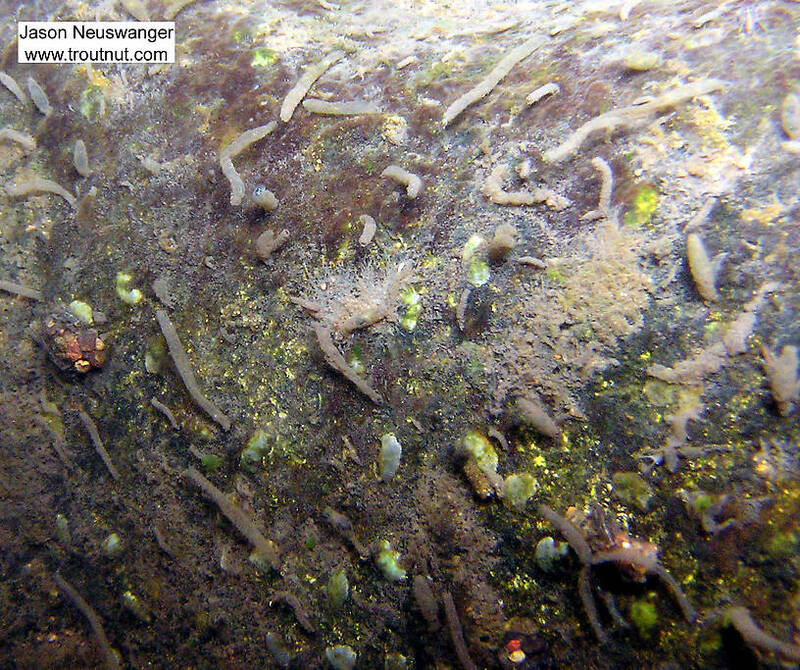 In this picture: Insect Order Trichoptera (Caddisflies) and Mayfly Species Ephemerella subvaria (Hendrickson). 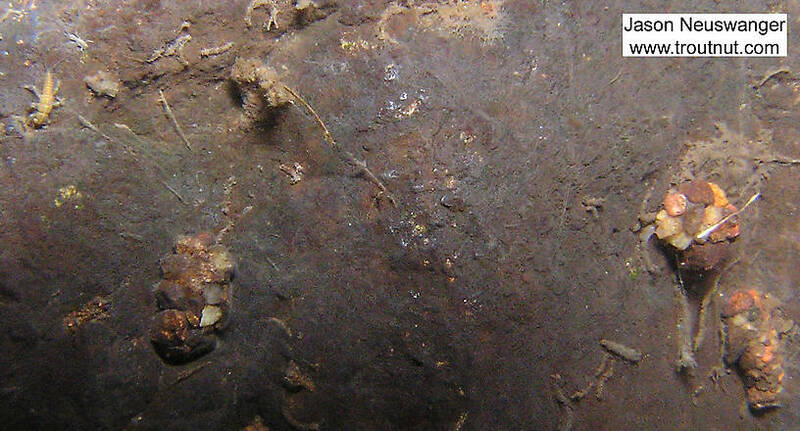 The strange tubes all over this rock house tiny midge larvae. In this picture: Insect Order Trichoptera (Caddisflies), Insect Order Ephemeroptera (Mayflies), and True Fly Family Chironomidae (Midges). 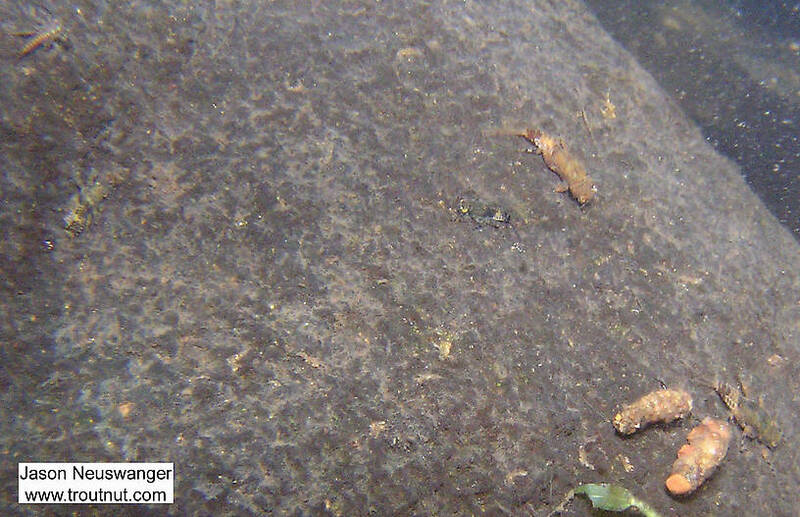 In this picture: Insect Order Trichoptera (Caddisflies), Insect Order Plecoptera (Stoneflies), and Insect Order Ephemeroptera (Mayflies). 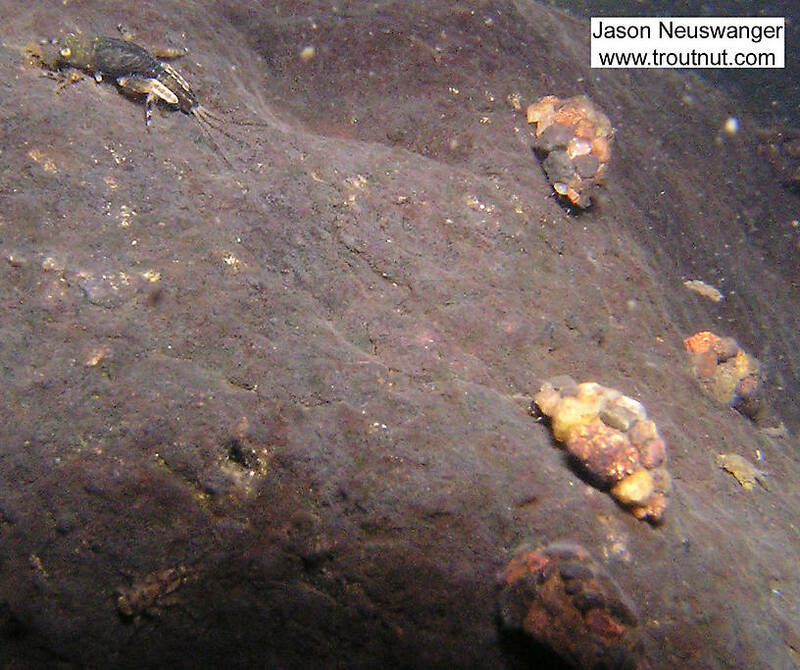 An Ephemerella subvaria nymph clings to a white rock in the foreground, and there are other nymphs in the background.